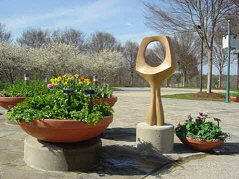 At The North Carolina Arboretum in Asheville, North Carolina, Magniflower 1, 2, and 3 continue on display around the pool at the entrance of the Education Center. Following display of Magniflower 1 and 2 as part of Kaleidoscope: Contemporary Landscape Sculpture, a 7-month exhibition in 2008, they were joined in October 2009 by Magniflower 3 and remain in place at the request of the Arboretum. 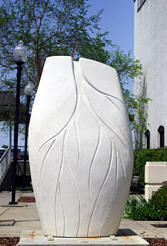 Opening Bud was selected in 1999 to be part of Waynesville, North Carolina's first StreetScapes public art program. It remained on prominent display downtown for ten years. Opening Bud now has a permanent home in the entrance garden of a private residence in the North Carolina mountains. 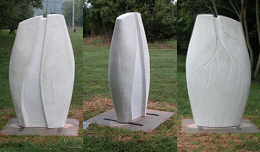 Stream was one of 14 sculptures installed for the first annual Salisbury Sculpture Show in Salisbury, North Carolina through January 11, 2010. Stream was beside the Waterworks Visual Arts Center at the Easy Street walkway. Bronzonia and Stance were in a small works show in Salisbury that opened May 1, 2009. 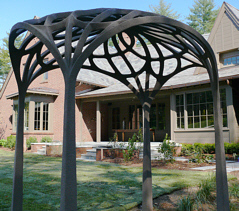 Arbor Neo-Nouveau was commissioned as a permanent part of the landscaping of HandMade House at The Ramble, Biltmore Forest, North Carolina. 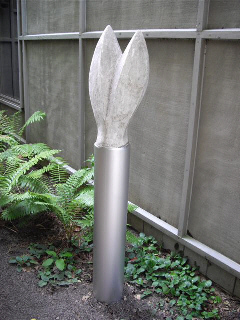 It was installed in September 2008. The complex steel armature for the ferrocement arbor required approximately 3,000 welds. A photo of Arbor Neo-Nouveau is featured on page 74 of the April 2009 issue of American Style magazine. 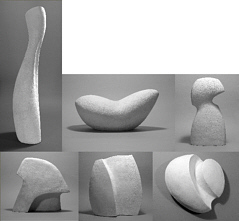 Six small fiberglass-reinforced cement works by Martin Webster were among the 78 pieces by 20 members of Mountain Sculptors in their 2008 exhibition at Upstairs Artspace in Tryon, North Carolina from August 29 through October 4. Watershed was installed on August 1, 2007 in Bristol, Tennessee/Virginia for exhibition through July 2008 as part of the Art in Public Places program of Arts Alliance Mountain Empire. Watershed was at 517 State Street on the Virginia side of the street, opposite the restored art deco Paramount Theater. Stream was on exhibition in the historic downtown riverfront of Wilmington, North Carolina from April 2007 through January, 2008 as part of the Pedestrian Art Project. 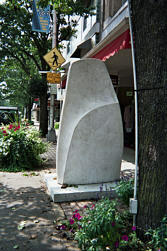 Six photos of the sculpture in its temporary home in the 200 block of North Front Street were featured on the PED ART website.